Wireless network security including application intelligence for the SME. 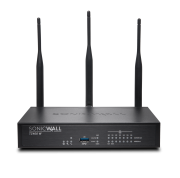 The wireless SonicWall TZ400 boasts firewall speeds of 1.3Gbps and full security at 300Mbps as well as being the lowest unit in the series providing application intelligence and control. The wireless TZ400 delivers 802.11 a/b/g/n/ac, full UTM security with Gateway AV, IPS and Application Control as well as Content Filtering and VPN.